I came across these while surfing the net... OH MY they look yummy.. Sorry girls.. I know we are suppose to be good but I couldn't resist!! LMAO!!!! Here is the recipie!!!!!!! 1 lb. (4 sticks) butter, room temperature1 lb. (2 cups) confectioner's sugar1/2 tsp. vanilla16 oz. tub of marshmallow cream . Cream the butter on high until it's light and fluffy. Add the confectioner's sugar, 1/4 cup at a time, and beat until fluffy each time. Beat in the vanilla until incorporated. Then dump in the Fluff and mix it up 'til it's all creamy. Transfer to pastry bag (if desired) and pipe onto cupcakes! (You can also cut the corner off a Ziploc bag and use that instead.) 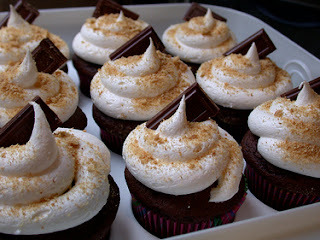 The tops are dusted with graham cracker crumbs, and each cupcake is topped with a square of Hershey's chocolate.